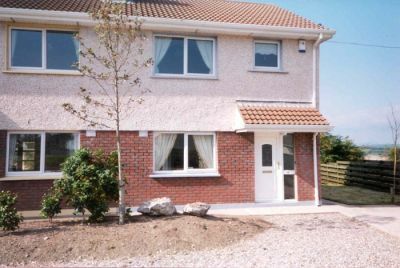 Comfortable three bedroom holiday homes situated in Youghal town, overlooking the Blackwater Estuary. These holiday homes are located just one kilometre from Youghal’s main street which boasts brightly painted shops, lively pubs, restaurants and cafes. These houses feature a master double room, 1 single room and 1 double room. Electric central heating. Features: Kitchen including microwave, dishwasher, washing machine/dryer, Bed linen and duvets provided, Beds are made upon arrival, Cots are available on request, Conservatory. Youghal town stands at the mouth of the beautiful River Blackwater and has miles of sandy beaches along with a host of local attractions. Local Activities: Miles of beautiful beaches, Whale and Dolphin Watching, Perks Indoor Entertainment Centre, Regal Film Centre, Golf, Pitch & Putt, Walking. From Shannon: N18 to Limerick, R513 to Ballylanders via Hospital, N8 to Mitchelstown, N72 to Fermoy, R634 to Youghal via Tallow. From Dublin: N7 to Newlands Cross, M9 to Junction 9 which is signposted Waterford, N9 to Mullinavat via Dungarvan, N25 to Lemybrien via Waterford, R634 to Youghal From Cork: N8 to Dunkettle Interchange, N25 to Killeagh via Castlemartyr, R634 to Youghal. In Youghal From Cork Side: Go through Clock Gate and continue up to the Pedestrian lights. 150 meters on turn left for Cork Hill (opposite Brodericks Hardware Shop). At the sign for District Hospital take next right. From Waterford Side: Take 2nd exit on roundabout, pass LIDLE shop and continue left for Cork Hill (opposite Brodericks Hardware Shop). At the sign for District Hospital take next right.